Aaron Ramsey and Mesut Ozil were in the starting eleven that faced Napoli and they both impressed in this match. They have reacted on their win over Napoli. The gunners are now one step into the UEFA Europa League semi finals after getting a 2-0 win over Napoli thanks to goals from Aaron Ramsey and Kalidou Koulibaly (OG) in the first half. The Arsenal fans were excited to see both Mesut Ozil and Aaron Ramsey in the starting eleven because these two always link up well with each other on the pitch. Aaron Ramsey played only 45 minutes in Arsenal’s match against Everton on Sunday because he wasn’t fully fit but he was this time in the squad that faced Napoli, and he played the full 90 minutes. 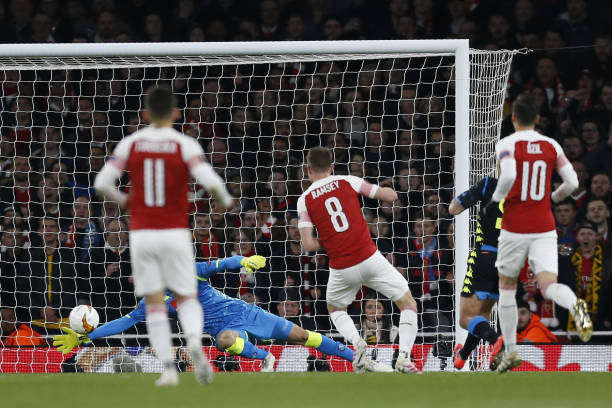 Aaron Ramsey once again showed Arsenal how they have made a mistake to let him go as he opened the scoring in the first minutes of the game after a beautiful move involving about four Arsenal players saw him receive the ball in the box and he put the ball into the back of the net. The Welshman has sent a message to the Arsenal fans via his social media account saying that the job is isn’t done yet. Mesut Ozil was in the Arsenal starting eleven that faced Napoli and he did redeem himself in this game for the poor performance that he had in the 1-0 loss to Everton on Sunday. The German international was involved in the first goal of Arsenal and the German has also reacted on this win via Twitter.